Santa Monica Press, 9781595800916, 480pp. Route 66 Adventure Handbook is your personal guide to the vanishing American roadside, with all of its exuberance, splendor, and absurdity. 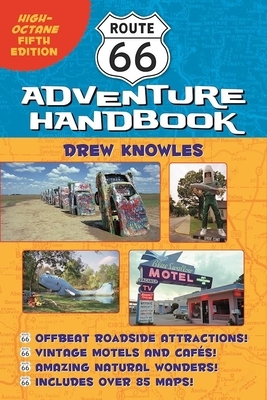 For this updated and expanded fifth edition, Drew Knowles has included it all: magnificent architecture, natural wonders, Art Deco masterpieces, vintage motels and cafes, unique museums, offbeat attractions, fascinating artifacts and icons, and kitschy tourist traps. The addition of city maps, showing the multiple paths of Route 66 and displaying the exact locations of points of interest, is a major improvement over the already critically acclaimed fourth edition of the book. The fifth edition also includes hundreds of beautiful new photographs and the addition of dozens of new attractions. Additionally, GPS coordinates have been added for virtually all of the photos, so that travelers can plug the information into their smartphones and other navigation devices and instantly determine where each photo was taken and compare it to the condition of that particular site at the time of their visit. Filled with wonderfully quirky side trips and fun bits of trivia, Route 66 Adventure Handbook is the most authoritative resource for anyone looking to explore the Mother Road. Fasten your seat belts. Drew Knowles is a photographer and writer with an insatiable interest in ruins, ghost towns, cemeteries, automobilia, and Route 66. Knowles has contributed articles to the National Historic Route 66 Federation News, and is a member of the Texas Photographic Society, the Society for Commercial Archaeology, and the Garland County (Arkansas) Historical Society. He is the author of Route 66 Quick Reference Encyclopedia.